Sapphire launched its Radeon HD 7970. Clockspeed of 925MHz and 5.5GHz 3GB GDDR5, basically the reference model. Custom versions will follow soon. The SAPPHIRE HD 7970 is the first graphics card in the world to incorporate the latest generation of GPU’s from AMD built in a new 28nm process and featuring the new GCN optimised graphics processing architecture. The HD 7970 is the most powerful single chip GPU ever built. It has a new internal structure with 32 compute units and a total of 2048 Stream processors. It ships with a core clock speed of 925MHz, but for enthusiasts wishing to maximise performance, a new version of the SAPPHIRE overclocking tool, TriXX will be available from launch. A new 384-bit high speed memory interface with over 264GB/sec memory bandwidth connects to a large 3GB array of the latest DDR5 memory. The HD 7000 series is the third generation of DirectX 11 compatible solutions from the graphics division of AMD - formerly ATI. 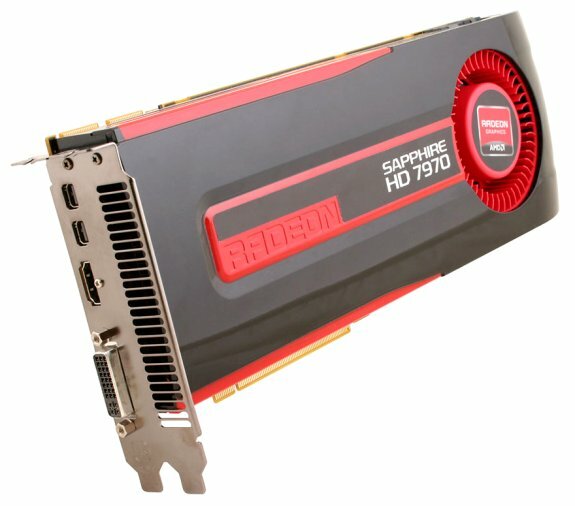 The SAPPHIRE HD 7970 is ready for DirectX 11.1 and the new Windows 8 operating system as well as delivering all the features of the current DirectX 11 such as DirectCompute11 and multi threaded communications with the CPU. Communication with the host PC is optimised with the implementation of the latest high speed PCI-Express Gen3.0 interface, and multiple cards can be used to further enhance performance in CrossFireX mode on a suitably specified mainboard. Working or gaming with multiple monitors is becoming increasingly popular, and the SAPPHIRE HD 7970 supports this with AMD Eyefinity. With its DVI, HDMI and two mini-DisplayPort outputs the card can support configurations of up to 6 monitors. In addition, the SAPPHIRE HD 7970 is the first graphics card that can simultaneously output multiple, independent audio streams allowing the correct audio content to be associated with different applications on different screens. The SAPPHIRE HD 7970 is the first in a new family of graphics cards in the HD 7000 series. It is shipping now through SAPPHIRE’s established channel and etail partners. The SAPPHIRE retail bundle is second to none. In addition to the standard bundle consisting of an Active mini-DP to single-link DVI adaptor for Eyefinity setup, CrossFire bridge cable, HDMI to DVI adaptor for dual DVI setup, DVI to VGA adaptor, 8 pin to 4 pin power adaptor and 6 pin to 4 pin power adaptor, SAPPHIRE also provides an extra mini-DP to DP adaptor and a 1.8 metre HDMI 1.4a cable. Additional models in the HD 7000 series with SAPPHIRE original designs and special features will be announced soon.